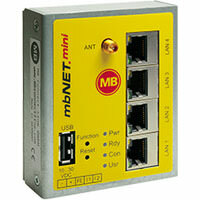 The industrial routers mbNET are specifically designed for industrial use. They enable a secure and reliable connection of machines and equipment via the Internet. See bottom of page for additional reading. 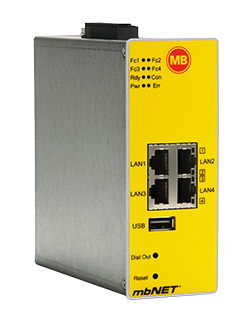 The industrial routers mbNET are specifically designed for industrial use. They enable a secure and reliable connection of machines and equipment via the Internet. They support various security protocols, so they are universally compatible. But the routers’ full performance is achieved when they are connected to the remote service platform mbCONNECT24. The integrated firewall ensures maximum access protection by allowing remote access only to identified and authenticated users. Thanks to a variety of interfaces and device drivers, you enjoy maintenance of different control systems, drives, operating panels, frequency converters and other components. Access to the Internet can be made through the intranet (corporate network), through the integrated modem (analog, 2G, 3G, or 4G) or through a broadband connection (DSL). 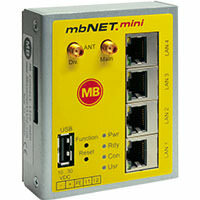 A suitable mbNET industrial router is available for almost every location infrastructure. 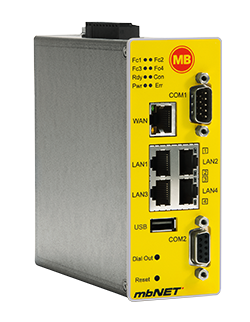 The mbNET industrial router from MB Connect Line has the largest range of performance and features. 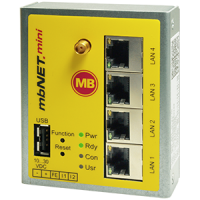 The different models: mbNET.easy, mbNET.basic and mbNET.mini are optimized for diverse applications and provide a budget friendly solution when the mbNET’s full scope of performance and features is not required. All models offer secure VPN encryption.